Despite all the “good food”/”bad food” hype you hear, healthful eating isn’t really so confusingly complicated. Stick to a diet based on whole foods (ideally organic), including lots of fresh produce, a minimum of industrially processed food and sugars, and a good amount of variety, and you’ll do fine. The problems largely arise when we venture into the area of commercially manufactured food. Those adjectives matter, for strictly speaking, most all food is “processed” in some way before we eat it – through cooking, say, or even just mixing ingredients together. Commercial manufacture takes it to a whole different level, often using ingredients that would otherwise never be found in your kitchen (and that your body has no need of). It also tends to beat the nutritional life out of its food-sourced ingredients, which is one reason for the recent emphasis on whole grains. The refining process strips nutrients and fiber from the grain. 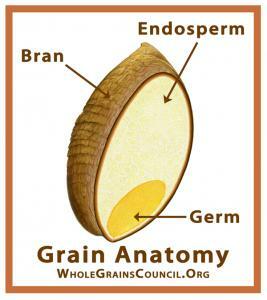 Whole grains and whole grain flours keep more of the good stuff by using all layers of a kernel: bran, endosperm and germ. They found that grain products with the Whole Grain Stamp, one of the most widely-used front-of-package symbols, were higher in fiber and lower in trans fats, but also contained significantly more sugar and calories compared to products without the Stamp. The three USDA recommended criteria also had mixed performance for identifying healthier grain products. Of course. 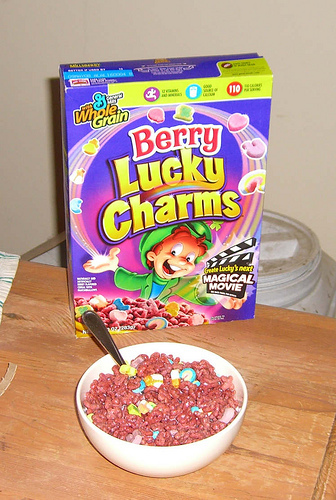 The first, second and fourth standards in particular allow for a lot of wiggle room – which is exactly how you get things like the magically health-haloed whole grain Lucky Charms and other sugarific cereals. 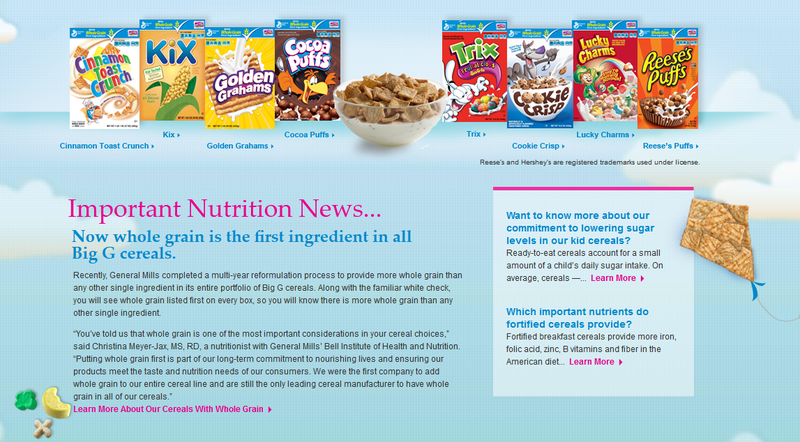 Not mentioned on that General Mills web page is the fact that “sugar” is the second most abundant ingredient in every product shown except Kix, in which it’s the third ingredient. (All include multiple sugars, as well.) They don’t have much to say about the artificial colors, flavors, preservatives and other additives either; nor the presence of GMOs in those products made with corn. But, hey, they’re whole grain, so they must be good, right? Ignore the front of the package; read the ingredients and nutrition info instead. And if you decide to consume the product, do in moderation. Products meeting this ratio were higher in fiber and lower in trans fats, sugar, and sodium, without higher calories than products that did not meet the ratio. The fact that people drink a lot of diet soda also means they are very likely drinking less of other (healthier) beverages. To give an example, according to one study , in 1966, the average American drank 20 gallons of soft drinks and 33 gallons of milk. But in 2003, those numbers were not just reversed, but the soft drinks took an additional big leap as well (46 gallons of soft drinks and 22 gallons of milk). Milk has its own detractors, but one must admit that milk also contains a lot of nutrients – protein, vitamins and calcium (we dentists like calcium). Diet soda? Not so much. OK, I’m not looking to advocate milk here (not yet, anyway). But if you are looking for something to drink, what’s wrong with drinking just plain old water? 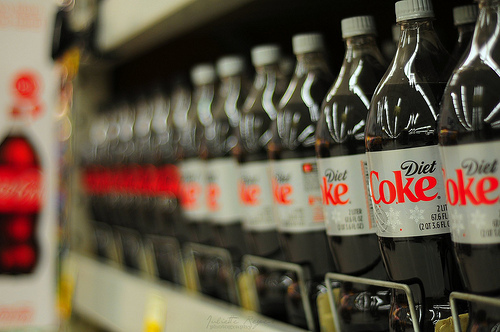 Indeed: The only ingredient in soft drinks that your body actually does need is water. It’s involved in every bodily function. Consequently, we can’t go much longer than a week without the stuff – water is life – and what we don’t get from food we need to drink. It’s also available right from the tap and at a fraction of the cost of soft drinks, though I do recommend filtering it. But even then, a filtering pitcher and a year’s worth of replacement filters is still cheaper than buying just one generic bottle of soda per week for a year. Think, too, of the money you’ll save on dental bills! The issue Dr. Connelly points to is akin to what’s known as the “health halo,” which materializes when one positive quality of a food affects our perception of the whole. It’s what gets a person to believe, for instance, that a presweetened cereal made with whole grains is healthier than the kind made with refined flour, despite it’s being just as loaded with sugars, artificial colors and other additives. One recent study of front-of-box nutrition claims shows health halos at work. The scientists said the front-of-box claims misled the participants in two ways. Secondly, they inferred that claims had broader meanings than their literal interpretation. The scientists said 44 per cent of participants thought nutrition-related claims meant the cereal contained higher nutrition levels compared to other brands of children’s cereal. Other recent research similarly shows how we often “eat the package” rather than the product. For this study, subjects were asked to taste test “organic” and “conventional” versions of three different foods: cookies, yogurt and potato chips. Confirming Lee’s health halo hypothesis, the subjects reported preferring almost all of the taste characteristics of the organically-labeled foods, even though they were actually identical to their conventionally-labeled counterparts. The foods labeled “organic” were also perceived to be significantly lower in calories and evoked a higher price tag. In addition, foods with the “organic” label were perceived as being lower in fat and higher in fiber. Overall, organically-labeled chips and cookies were considered to be more nutritious than their “non-organic” counterparts. One product that’s recently developed a halo is sea salt, which – according to an American Heart Association survey – 61% of consumers think is a “low-sodium alternative” to table salt. It’s not. In reality, the only real difference between the two is that sea salt is less processed. This, according to John Franklin, Cargill’s marketing manager for salt (yes, there really is such a position! ), may explain consumers’ mistake. Sea salt naturally contained beneficial minerals that were stripped out of table salt such as magnesium, calcium and potassium, but its biggest USP [unique selling proposition] was its unprocessed image, said Franklin. For a detailed discussion of sea vs. table salt, see this terrific guest post at Fooducate. The moral of the story? Ignore the front of the package; read the ingredients and nutrition info instead. And if you decide to consume the product, do in moderation.